Reefstar Cruises is a family owned and operated business based in the Whitsundays. We are proud to offer outstanding day trips to visitors of the region, providing unique opportunites to explore and enjoy the best of the Whitsunday Islands. Our large comfortable vessel is ideal for all ages, offering a stable, relaxed setting for family and friends to enjoy a great day out. In just one day we can share a taste of not just coral reef, but the areas islands and beaches too. Stroll the pure white silica sands of Southern Whitehaven Beach, relax and cool off in the clear waters (Relax and Explore tour will spend 3 hours at Whitehaven, Ultimate Experience tour will spend approximately 1.5 hours). Tour includes courtesy coach, morning and afternoon tea, cold buffet lunch, snorkel equipment or glass bottom boat tour. Both tour options take place on the same vessel. Please note that travel times and itinerary can vary with wind and tide. Relax with a complimentary tea/coffee as we cruise into the Great Barrier Reef World Heritage Area. The journey passes the Molle Islands and across Whitsunday Passage to Whitsunday Island. Join our crew as we transfer to the shore of Whitehaven Beach. Stretching 7km, this pure white silica sand beach has been voted #1 in Australia. Cool off in the turquoise waters, stroll the shallows or simply relax. Relax and Explore tour guests have three hours to kick back and relax on the shores of Whitehaven, and explore the surrounds. a Guided bushwalk on the short scenic Solway Circuit to see stunning views of the Marine Park will be available for Relax and Explore tour guests to join. Ultimate Experience tour guests will have approximately 1 to 1.5 hours to spend on Whitehaven Beach, before or after being transferred to Tongue Bay for their Hill Inlet lookout walk. The lookout walking track is approximately 800m and includes some steps at the beginning (this walk does require a moderate fitness level). Marvel at he picturesque shifting sand and aqua waters of this spectacular location! Make the most of this panoramic photo opportunity before returning to the vessel based at Whitehaven. Enjoy your lunch in air conditioned comfort at anchor at Whitehaven Beach. A selection of cold meats, salads and breads are freshly prepared daily. Licensed bar available. A suitable coral reef site will be chosen to suit the conditions of the day. Fringing reef can be enjoyed near Whitsunday or Hook Islands. Both tours will have up to three hours of snorkelling or a Glass Bottom Boat Tour (this option is available to both tours). Our reef guide will pull alongside MV2001 and board guests directly. This is a wonderful opportunity to enjoy the colourful coral, fish and turtles whilst learning about them. Snorkelling begins from the calm waters surrounding the island. Guests must be able to swim and complete a snorkel assessment form for this activity. The crew will transfer guests with their equipment to the shallows. Back aboard MV2001 enjoy afternoon tea, relax and recount your adventures with family and friends. Join our courtesy coach and return to your accommodation. We are making your own way to the Marina, where do we meet? The Reefstar Team can be found in the courtyard adjacent the bus stop, Abell Point Marina South. Check-in for the Whitsundays Island Cruise is at 7:20am. Paid parking is available at the Marina. Do you ever cancel the trip? Only in severe weather conditions and mechanical breakdown is the trip cancelled. Guests will be notified of any change and offered another date of travel or full refund of any monies paid to Reefstar Cruises. Provided we have availability you are welcome to change the date of your booking up to 24 hours prior to departure. Cancellations after this time incur 100% fare price. Reefstar Cruises operate year round. We offer 4 days of cruising throughout the year. Our wonderful Whitsundays locations offer great sub-tropical weather and warmth. The Whitsundays Island Cruise operates from 8am to 5:30pm approximately. It offers three stops of 1 to 2 hours. Our freshly prepared buffet lunch served on the Whitsundays Island Cruise includes vegetarian and gluten free options. Please contact us with any specific dietary requirements and food allergies. Can I smoke onboard the vessel? No. For the safety and protection of our guests and the environment we are a non-smoking vessel. Please remember to bin your butts if smoking ashore the islands. Is the tour suitable for wheelchair passengers? No. MV2001 loading facilities and toilets are not wheelchair accessible. For more information please contact us. What is seating like onboard the vessel? Lounge style seating is available inside on the lower and upper decks. Outside seating is also available on the upper deck. Not generally. The waters of the Whitsundays are generally protected by the islands. Our large catamaran offers a stable platform, but those prone to travel sickness may like to take medication prior to the cruise. 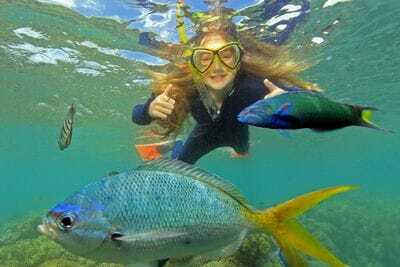 Can I do both the snorkel and Glass Bottom boat tour? No. Time limits to the choice of one activity only. What do I need to know to snorkel? Guests must be able to swim and are required to complete a snorkel assessment form which details any health reasons to exclude participants from the activity. Our friendly crew offer a demonstration on snorkelling technique along with flotation aids for non-confident swimmers. What snorkelling equipment is supplied? Reefstar provides mask, snorkel, fins and flotation device. Guests are welcome to bring their own equipment including prescription masks as required. Prescription masks are available for hire from AquaDive in Abell Point Marina, North and are at cost to the hirer. Stinger suits are provided free of charge (seasonally). These full boy lycra suits are available in all sizes from 0 to XXL and offer great protection from stingers and sunburn. These are also available during winter months upon request at check-in. Guests are welcome to bring their own wetsuits as required. 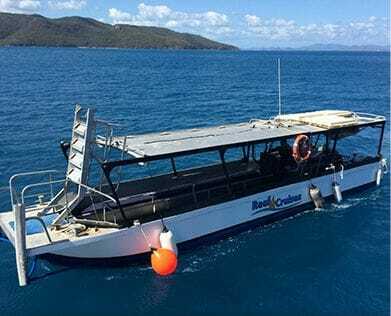 Is the Glass Bottom Boat Tour included on the Full day Whitsundays Island Cruise? Yes. Our custom built Glass Bottom Boat Tour is conducted at the chosen fringing coral reef location. Our Reef Guide will join you to provide an informative commentary of the reef and its inhabitants. Yes. Our licensed bar stocks a range of wines, beers and spirits as well as soft drinks. Can I use credit card on the boat? Yes, mobile eftpos is available on the vessel. Are there toilets on the boat? We have four normal style toilets onboard. Can I take a pram on the boat? Yes. There is room for a pram to be taken onto the lower deck. Prams are not suitable on the islands however. Please advise at time of booking. Is the tour suitable for children? Yes. A great vessel for all ages, the tour offers something for the whole family. Our friendly crew are happy to assist everyone to get involved. Do I need to worry about jellyfish stings? What sizes are the stinger suits? The lycra stinger suits range from a size 0 (2 years) to XXXL. How do I get from the boat to the island stops? Smaller tenders are used to transport guests from the boat onto the shore. These boats hold up to 8 guests and are entered from stairs off the rear deck of MV2001. What do I need to know about boat safety? Take care when embarking or disembarking the vessel, it may be wet and slippery. Beware of the roof height and please ask for assistance if required. We ask that you remain seated at all times while the vessel is underway, or until advised by the crew that it is safe to move about the vessel. If moving to the foredeck or upper deck please go slowly and use handrails. Toilets are situated on the lower aft deck. Hot drinks are available from the galley. Please ask crew for assistance. Avoid burns by not overfilling your cup and securely fitting a lid. MV2001 is a licensed premise and the crew has the right to refuse service to those deemed intoxicated or underage. Life jackets are situated under seats on the upper and lower deck. Children's jackets are located below the windows on the lower deck. To fit a life jacket place held through hole, the small section to the back of the neck. Place arms through tapes and pull down firmly. Cross tapes at back and tie in front with a bow. When jumping into the water hold down the front of the jacket. A light and whistle is attached to the jacket to attract attention if required. Safety rafts will be deployed from the vessels upper decks if required. Reefstar Cruises recommends the use of stinger suits at all times. Please accurately complete your snorkeler assessment form and adhere to swimming advice given by crew at all times. Take care and follow crew instructions when entering and exiting the vessels tender. Please ask for any assistance required. what an experience and... what value for money.